Stand on the first tee and take a moment to look at your surroundings. 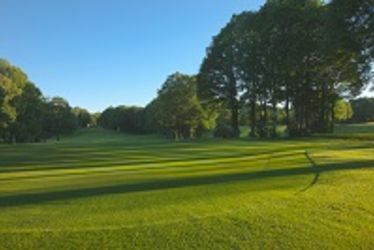 The view toward the green typifies what this course is all about - a beautiful aspect with trees lining the fairway on both sides and the land falling away in front of you only to rise again to the level of the green. In practice this is a fairly gentle introduction to your round. A straight forward par four, where a drive to the bottom of the valley or just beyond should leave an easy approach to the green defended by bunkers left and right.